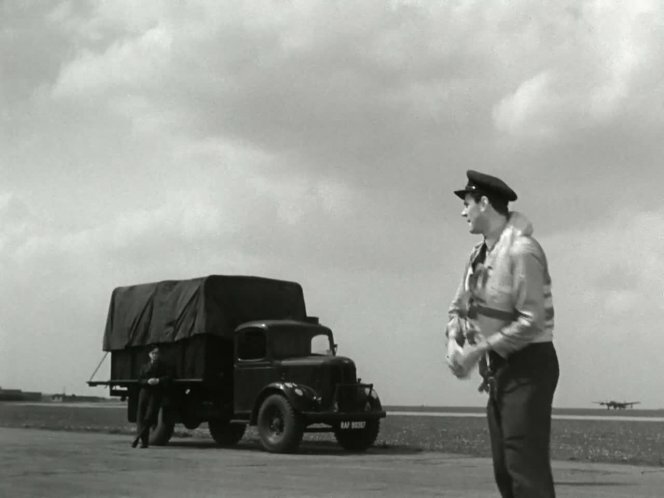 IMCDb.org: 1941 Austin K3/KJ 3-Ton GS in "The Dam Busters, 1955"
This is not a K5 which was a forward control 3ton 4x4 of very angular appearance. This is a K2 or K3, a normal control 2 or 3 ton 4x2 with the cab, bonnet and front wings of the commercial K Series lorries introduced in 1939. The radiator was altered slightly on the military versions to assist cooling and the commercial wheels replaced, on all but the earliest vehicles, with the larger diameter single wheels shown here. Body sides divided into four equal sections suggests longer (158" wheelbase) K3. K2 2-ton GS truck shown to date with 3½ sections (134" wheelbase).